Make your way inside this lightweight Minnie travel trailer model 2606RL and be delighted by what you see. There are two entry/exit doors for added convenience. A large slide out u-shaped dinette creates plenty of dining space, plus this is a great area for enjoying a board game or cards with family or friends. You can also convert the dinette easily into added sleeping space for overnight guests. A walk-through bath leaves the private bedroom up front separated from the back of the unit. With a space saving sliding door from the bathroom to the front bedroom you will have plenty of room for moving around. The private entry/exit in the bedroom allows you to quietly slip in and out for an early morning stroll without disturbing anyone sleeping in the back of the unit until they are fully awake. Awesome RV in Chehalis and Olympia, Washington offers great low prices for new & used recreational vehicles to all of our neighbors in Olympia, Tacoma, and Lakewood. Our Expert Service & Parts staff help our RV customers keep their Winnebago and Evergreen vehicles in great shape. 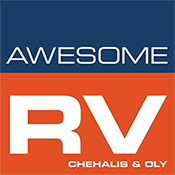 We at Awesome RV in Chehalis and Olympia, WA, look forward to serving all your RV needs and we hope that we can help you with your next new or pre-owned Winnebago or Evergreen purchase. We have helped customers from Lacey, Longview, Spanaway, and Seattle with their recreational vehicle needs and we look forward to helping you.